True to its name, the White-rumped Sandpiper has a white rump, which is a unique character among small sandpipers, collectively known as "peeps." This bird has one of the longest migrations of any species in the Western Hemisphere as it breeds in the northernmost Arctic tundra and winters in southernmost South America. In Tennessee, the White-rumped Sandpiper is usually found in flocks with other peeps during spring migration from early May to early June, and from mid-August to mid-September in fall. While more frequently encountered in West Tennessee near the Mississippi River, it has been found across the state. Description: This small to medium-sized sandpiper has a medium-length straight bill, medium-length legs, a short neck, wings that extend past the end of the tail at rest, and a large white patch at the base of the tail visible in flight. The underparts are white with fine dark streaks on a pale gray breast. Breeding plumaged adults (April-September) have gray and rufous on the back; non-breeding adults (August-April) are gray above. Voice: Call a high, thin metallic tzeep. 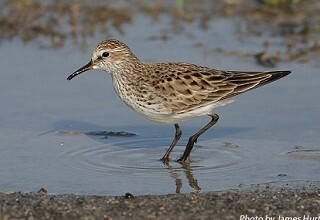 Baird's Sandpiper is very similar in size, shape, and markings, but is slimmer, usually browner, more scaly on the back, and lacks a white rump (a character visible only in flight). Dunlin are larger and have a more down-curved bill. Habitat: In Tennessee found on exposed mudflats, flooded fields, and the edges of ponds and lakes. Diet: Insects, and mollusks, also some plant material. Nesting and reproduction: The White-rumped Sandpiper breeds in the high arctic, and has never been known to nest in Tennessee. Status in Tennessee: A regular but uncommon spring and rare fall migrant that can occur statewide, but is most frequently encountered in far western Tennessee. Spring migration is from early May to early June, and fall migration from mid-August to mid-September. The White-rumped Sandpiper has one of the longest migrations of any American bird, breeding in arctic Canada and wintering in southern South America. Southbound migrants fly over the Atlantic Ocean from northeastern North America to northern South America, and then gradually move southward along the coast before crossing the Amazon Basin. This migration is made in a few, long, non-stop flights, each of which can last as long as 60 hours and transport these birds up to 4,000 kilometers. The body fat required for this migration makes this species especially vulnerable to loss of foraging habitat anywhere along its route. The actually rump feathers of the White-rumped Sandpiper are dark. The white feathers are actually upper tail coverts, special feathers that cover the base of the stiff tail feathers. Louis Jean Pierre Vieillot, a French ornithologist, first described the White-rumped Sandpiper in 1819. Best places to see in Tennessee: There are few reliable places to find White-rumped Sandpipers, but Ensley Bottoms and various flooded fields in the Mississippi Alluvial Valley can be good places to look. Parmelee, D. F. 1992. White-rumped Sandpiper (Calidris fuscicollis). The Birds of North America No. 29 (A. Poole and F. Gill, eds.). The Academy of Natural Sciences, Philadelphia, PA, and The American Ornithologists' Union, Washington, D.C.